I took a mini-break to North Devon over the weekend. It was lovely - the countryside, the seaside, the fish and chips and cream tea :) I saw lots of sheep (more on that later) but, more importantly, it was 4 hours in the car each way and plenty of driving between towns. That makes for a lot of knitting time. 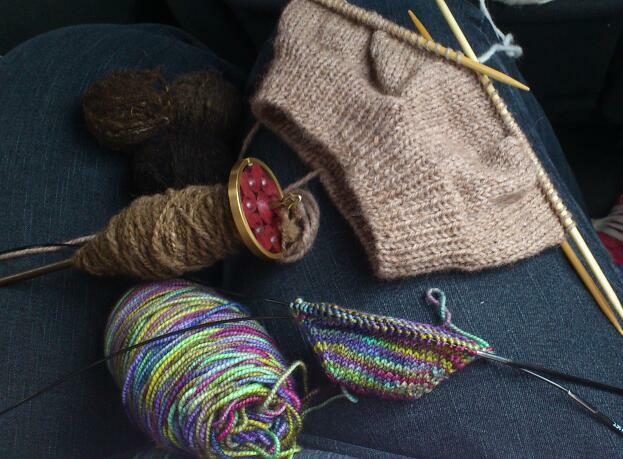 I brought three projects with me for the trip - plying 4 shades for my Sheep Heid hat, a slouchy hat to go with my Katie sweater, and a sock - Pomatomus by Cookie A. Before the trip, the singles were all unplied, the sock had yet to be cast on, and I had only knit the ribbing of the hat. On the crown decreases for the hat (we arrived home at around dinner time, so I ended up finishing the hat that night), plied all the singles, and a few rounds into the chart on Pomatomus. I think it's so neat to watch fabric being made beneath your fingers - knitting can be slow, but when you see progress being made, it's a great feeling. I guess that's part of why I prefer small projects to big ones! Hehe thanks! It comes from practice I guess. And I LOVE how that sock yarn is knitting up - I was worried that all the colors would clash and it would ruin the pattern, but I'm really pleased with it.